‘Will run for beer’ just doesn’t even cut it. It was more like ‘will run after chugging beer’. 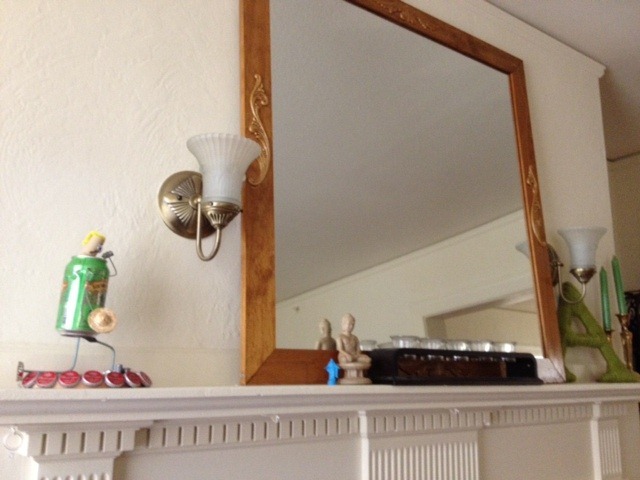 Ugghhhh…why? 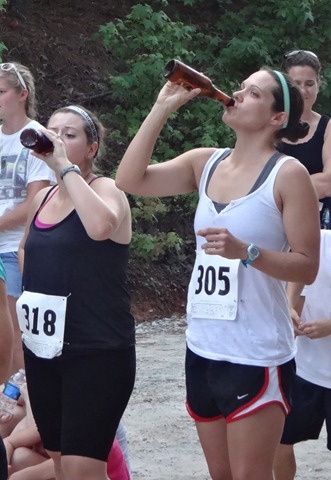 When I was invited to attend the 6th Annual Beer Mile on Saturday by my fellow co-workers I just couldn’t pass up the opportunity. 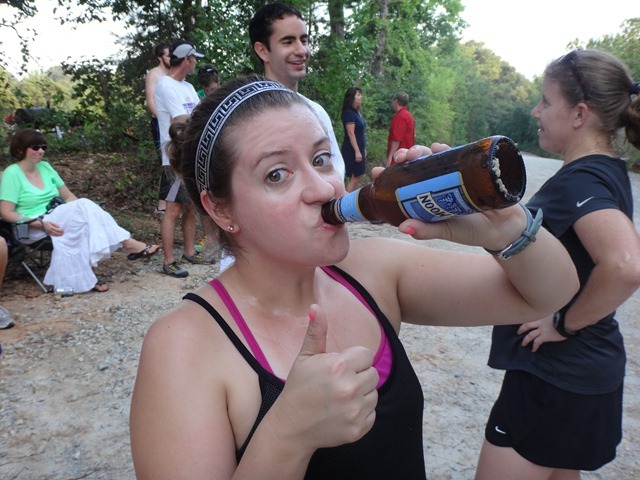 Back home we do a Booze Cruise every year [beer + bicycles.. probably not the safest of ideas] but here in GA they do their own version of a Booze Cruise [beer + running = Beer Mile]. I will admit I was curious as to how this would work and how I would be able to handle it. 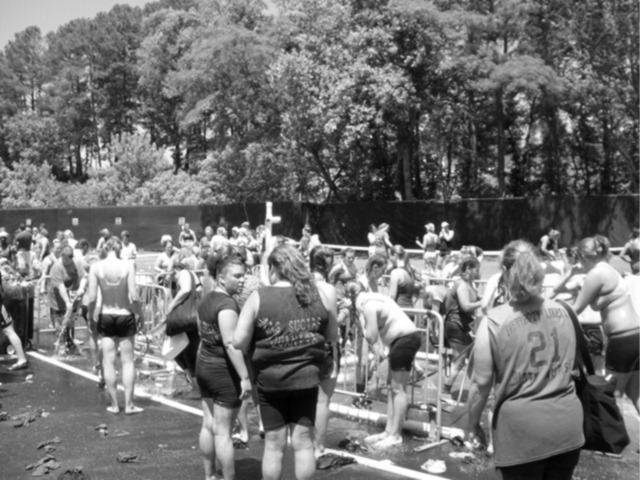 But I took on the Beer Mile challenge like a champ! 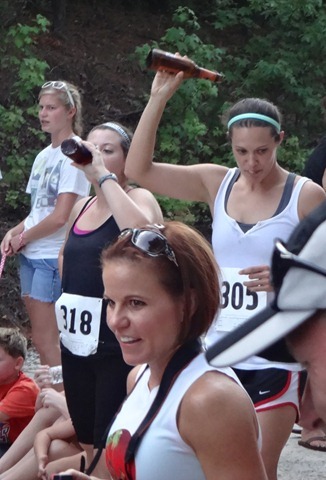 The rules are simply this…you must chug a beer (at least 5% alcohol) then run a quarter mile. 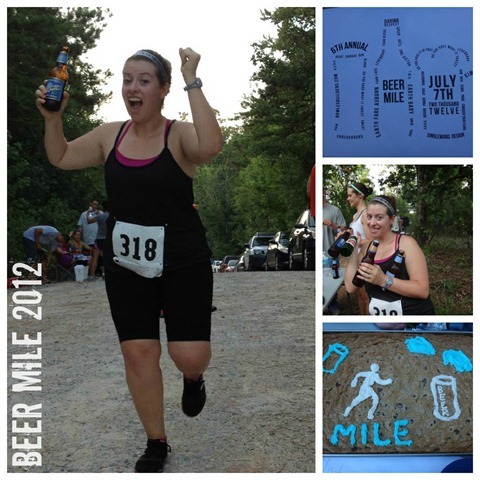 You continue this process as quickly as possible until you have completed the beer mile [4 beers and 4 quarter mile laps]. A penalty lap is added at the end if at any point you throw up. Once the rules were announced the chugging began. After each beer was downed you were supposed to tilt it over your head to signify that you were finished. And then you run like crazy! 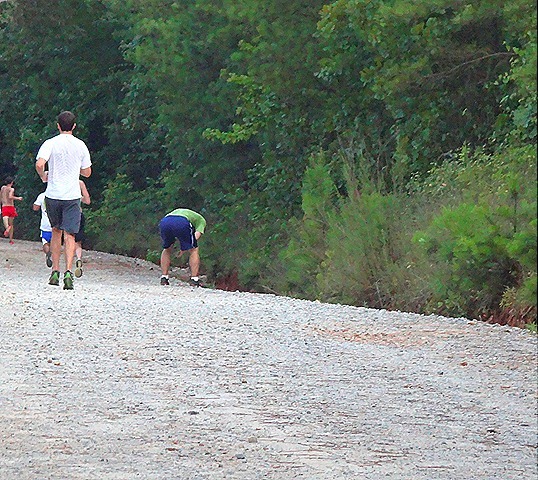 I wasn’t so worried about the running part because a quarter of a mile sounded super easy. But when you throw in a pretty steep hill and a tummy full of carbonation and alcohol you are dealing with a whole different beast. I downed the first beer and completed the first lap no problem. It was the start of that second beer that was giving me some trouble. I got it down, but honestly was feeling a little rough at this point. Once I started back down the hill I felt better [believe it or not]. Though the thought of trying to down a third beer was not sitting well. 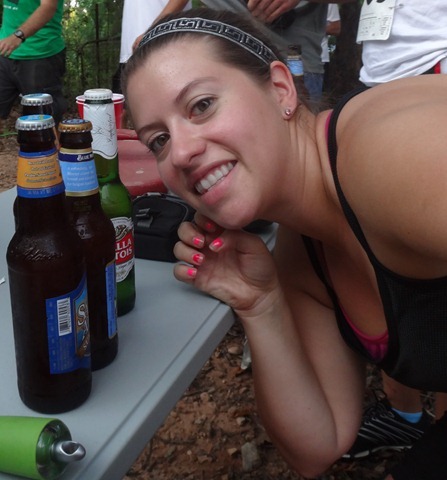 I reached the top of the hill and grabbed beer number three. At this point I was having some serious doubts. My stomach hurt and just the taste of this beer was making me want to vomit. I looked over to see this sight — totally didn’t help. People were losing it right and left and I was pretty sure I was next. I would take a sip and then pace around for a minute trying to convince myself that I had it in me to do this. Thoughts of a DNF [did not finish] were tempting. I looked over at my fellow co-worker who was struggling just as much as I at this point and we finished off our third beer with much agony in our faces. 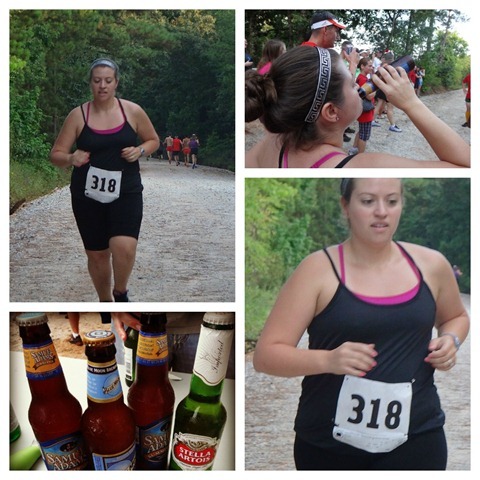 She promised to run the rest of the race with me, but decided that a fourth beer just wasn’t going to work. I was ready to quit drinking at this point too until it happened. I puked, but honestly felt this rush come over me. 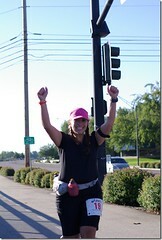 I had a second wind and was ready to finish this race strong. We sprinted up the hill knowing I had one final beer to drink and two stupid laps to run due to my having to add on a penalty lap. I drank that last beer as quickly as I could. It went down a lot easier then the previous two. I was just ready to be done at this point. Thank goodness for my co-worker. 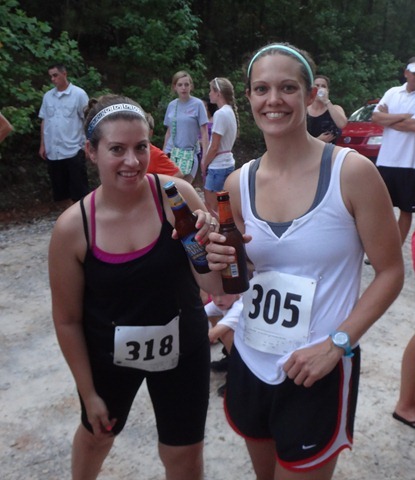 She ran with me the final two laps until I could cross that finish line as an official Beer Mile finisher. Even though she didn’t finish her 4th beer, she was still a trooper! Me an official beer mile finisher! 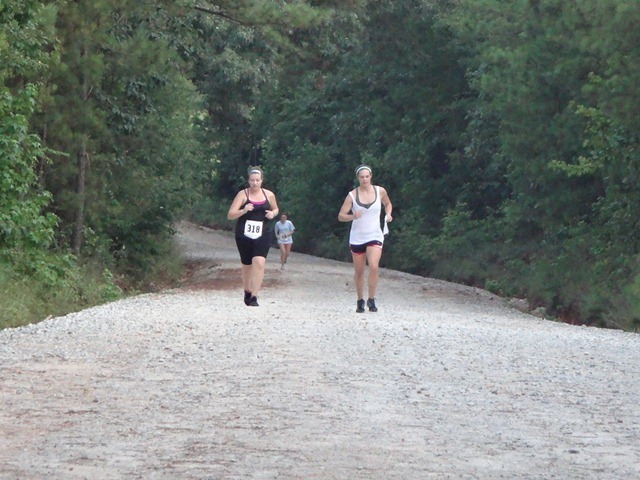 You can see the girl in the background bringing up the cones, as I was the last person to finish the race. You may call that being a loser, but in this race even the loser wins! Shortly after the race they did an awards presentation. 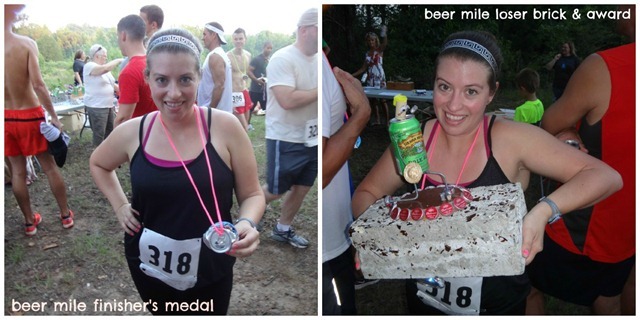 Another fellow co-worker won fastest beer mile in the woman’s category and received the prize of the golden shoe. 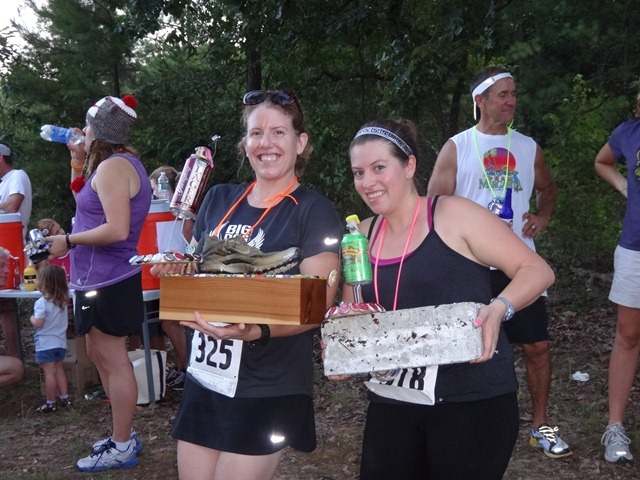 And I won last woman finisher [finishing time of 25:02] and was happy to be carrying off the brick of glass chards. Oh my! I’ve never once won anything in a running race, how hilarious that I win something for last place? Oh yes, and let’s not forget the finisher’s medals! Check out that beer can on a shoe string. Too funny!! 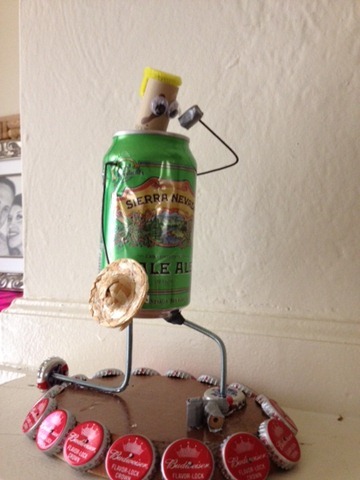 I’m happy to say that I placed my beer can award on the mantel to show off my accomplishments of at least winning something at this race. I bet my husband is so proud of me. 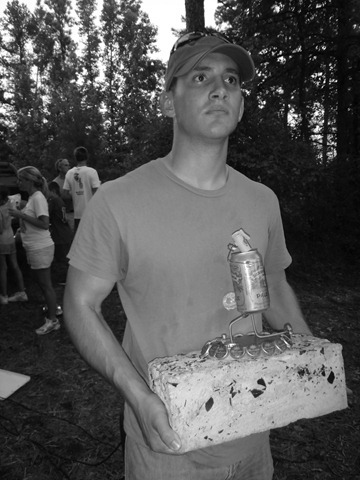 Sure looks that way as he was carrying out my brick to the car upon our departure of the race. 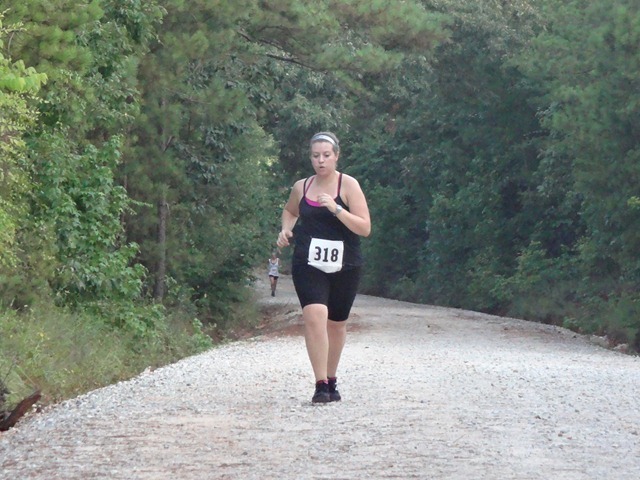 This race was by far one of the hardest races I have ever ran. I’m not really even sure if I would embark on such a crazy adventure again. 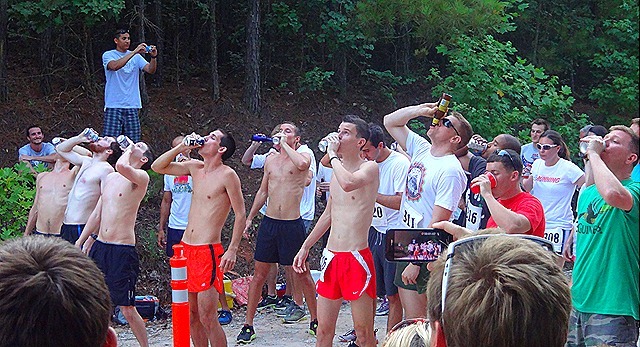 It was fun to say I did it, but the beer mile is no joke. 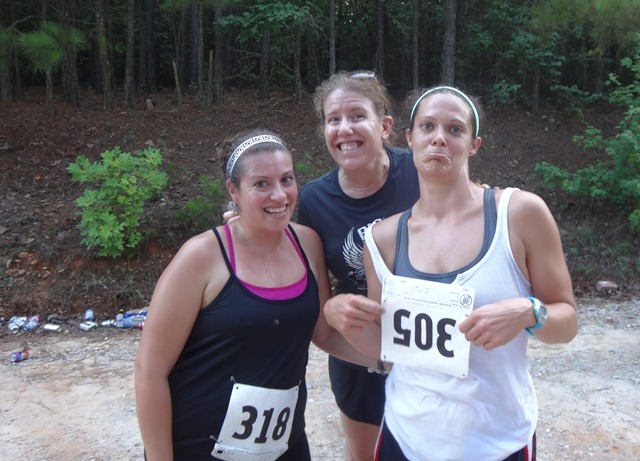 Our work group photo: one loser, one winner and one DNF. Way to represent!! Just curious! 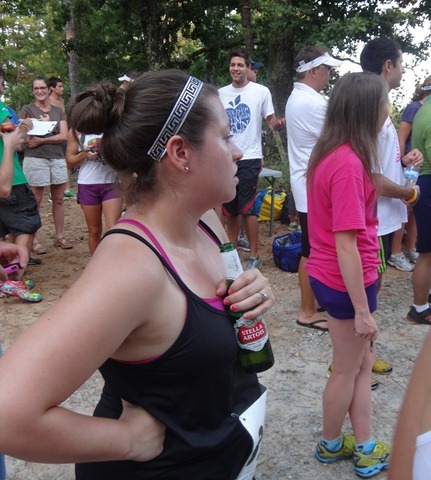 Would you ever even consider doing a race that involved running and beer chugging? 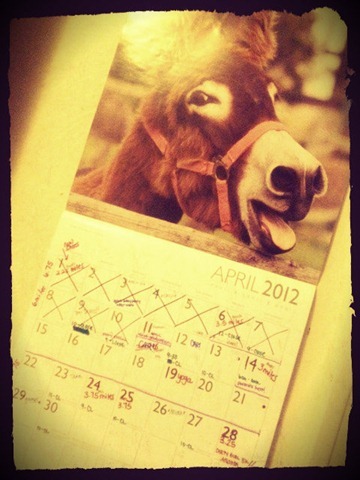 Donkey agrees, it was quite the busy month. My mileage is still pretty measly, but with the purchase of two new pairs of running shoes and some new running motivation (running friends & groups) I have a good feeling for May. 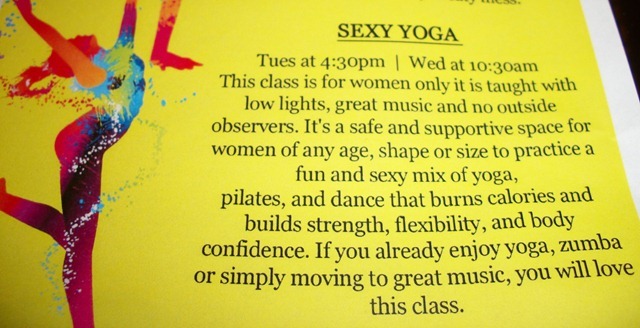 My work schedule does not really work well with the fitness classes offered at the gym. There may be a few nights I can squeeze in Zumba but other than I’m going to have to get creative in my workouts. 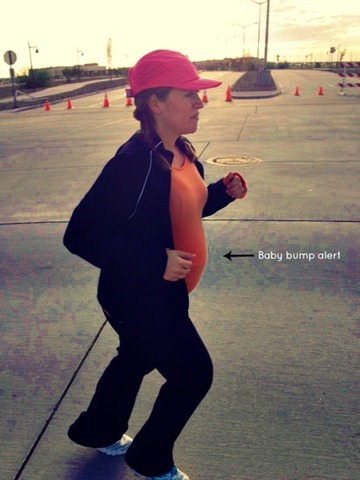 Hence why I foresee a lot more running in my future, (it’s a great solo fitness activity). Announcement of the month: What’s next for the Alabama’s? Hello Texas! [We still have a few months here in GA]. 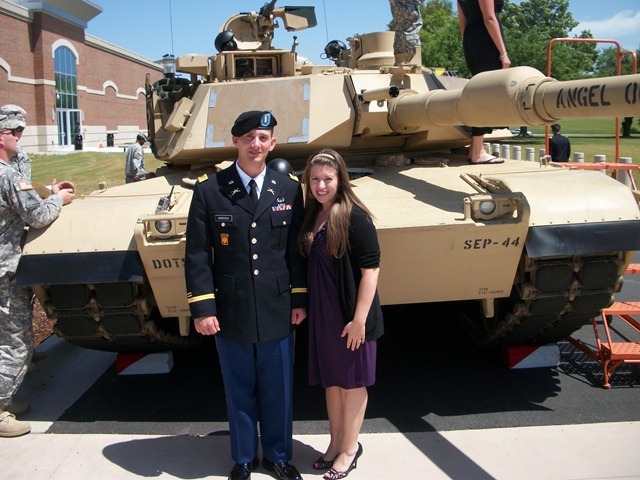 Army Moment of the month: Graduation! J. graduated from his Army Officer Basic Leadership Course – which was a 5 month course that brought us to GA in the first place. Since we already here in Fort Benning, he has decided to add on a few more smaller schools such as Ranger, ARC (Armor Reconnaissance Course), and maybe even Airborne. 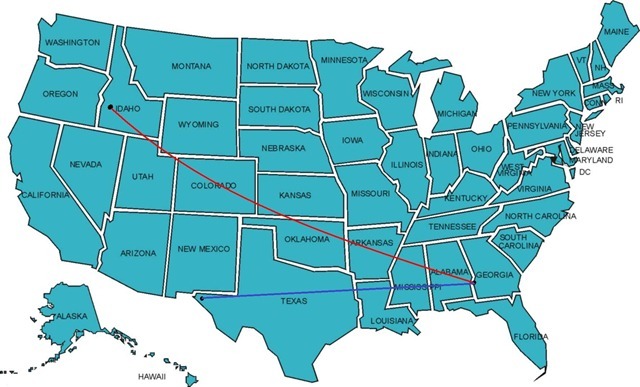 Which is why we will be in GA a little bit longer than we originally thought. 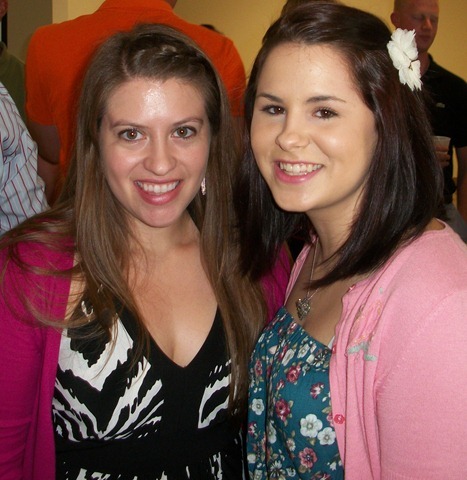 We Army Wives have grown really close over the last few months, so it was really hard to say goodbye when our first Army Wife had to move on to their next duty station. 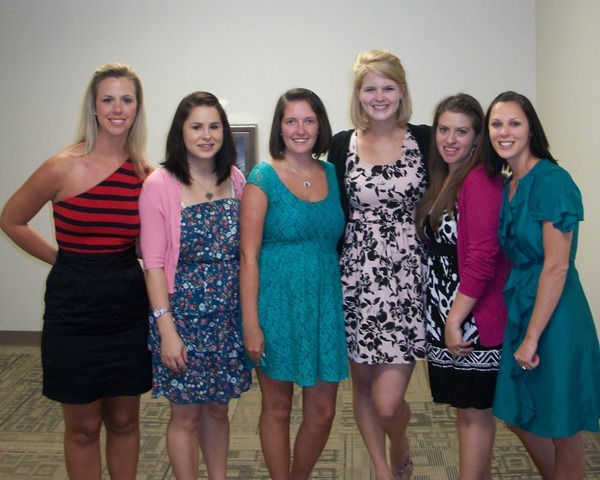 It’s inevitable that we will all have to leave at some point, but saying goodbye was really sad. 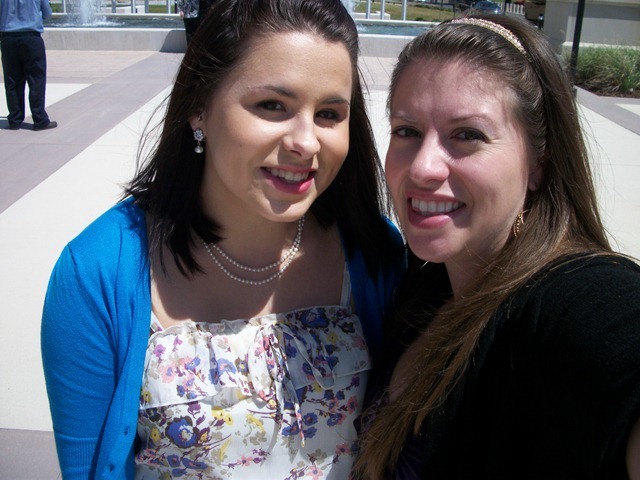 Kait was my first real friend here. 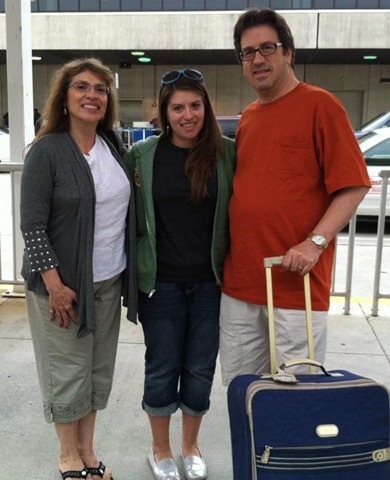 Not only did we get to spend a lovely week with my parents this month, we also had a quick visit with J’s sister. Yay for family! 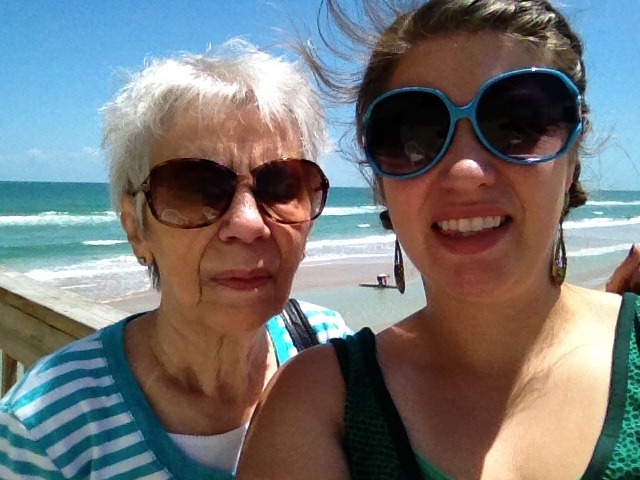 And let’s not forget the epic 2.5 day road trip to Daytona Beach to visit my Grandma! April was a busy busy month and I think things might be slowing down just a wee bit this month. I don’t have anything huge and exciting planned for this month, except for that whole turning 29 thing. Eeek. LOL. 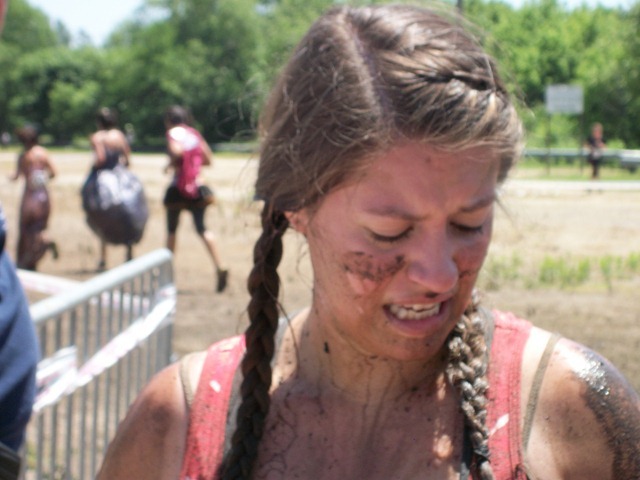 On Saturday I embarked on an adventure of endurance, strength and filth. 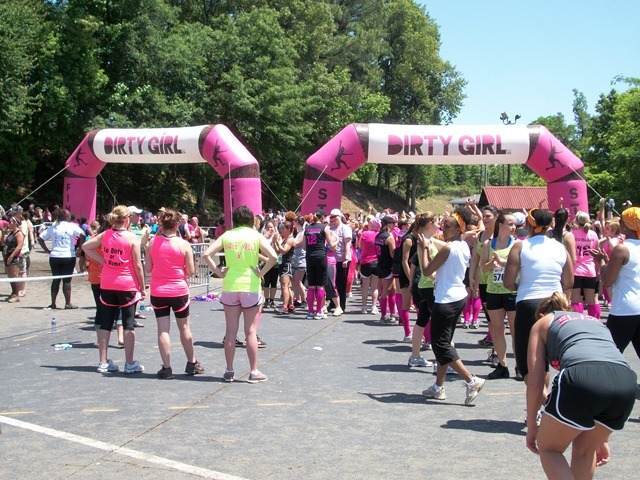 The Dirty Girl Mud Run kicked off in Atlanta, Georgia and I was so excited to be there representing FitFluential out on the course. 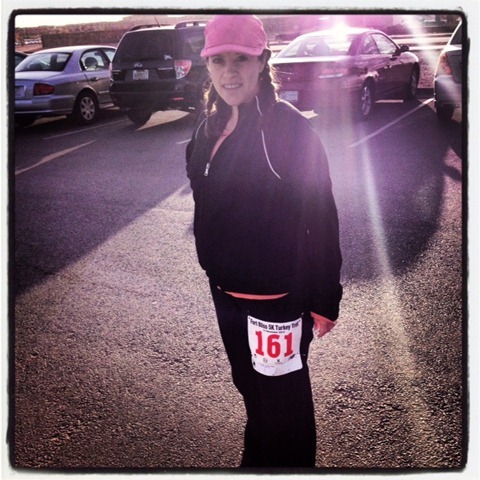 And in true Fitfluential [and Linzi] style, I ran this race with a girl of whom I’d met only once, and randomly at that [we met on a college campus while I was working an expo for my running store job and within a few minutes of meeting she had signed up to run this race with me]. True story. 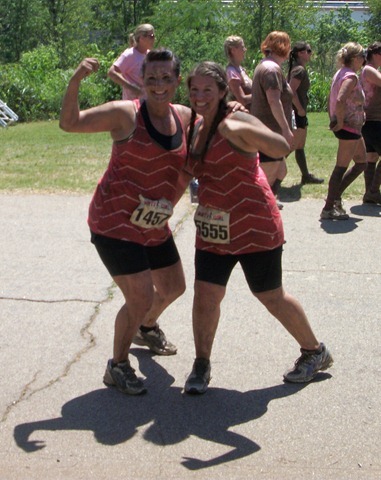 As you might know, I am a mud running veteran. 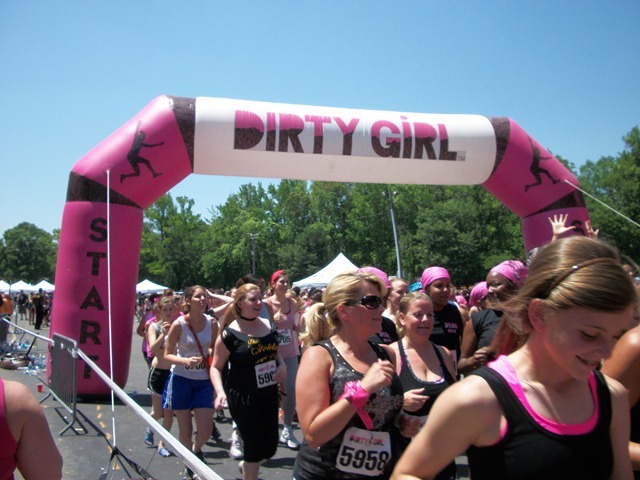 I’ve got two Dirty Dashes under my belt, but I honestly still did not know quite what to expect at The Dirty Girl race. 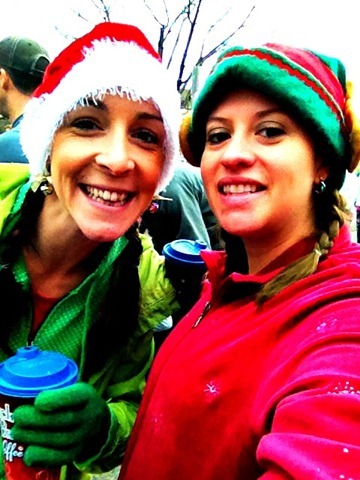 All I knew is that this was going to be a women only race, and it was sure to be a good time had by all. A huge shout out to my friend (and photographer) Emily! 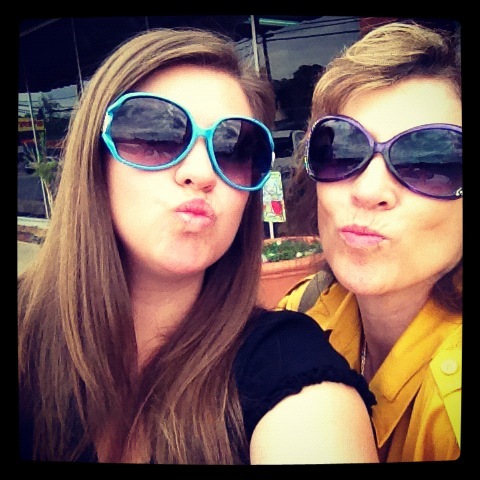 I would have been so lost without her to keep me company on the 2 hour drive from Columbus to Atlanta. We arrived at the expo to pick up my packet roughly two hours before my wave start. 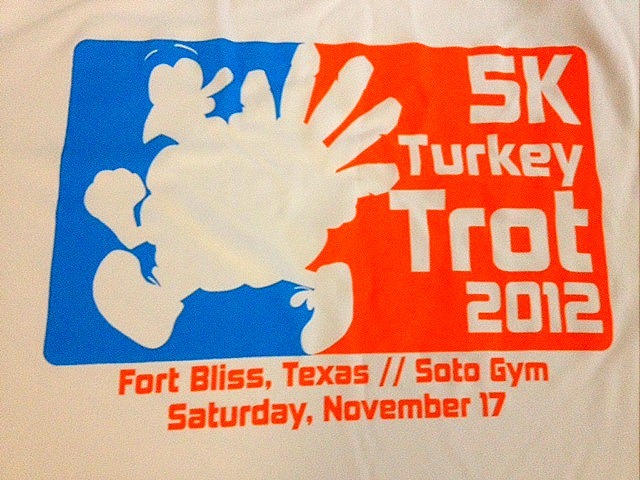 Thank goodness we did, as the packet pickup lines were loooooooooong! 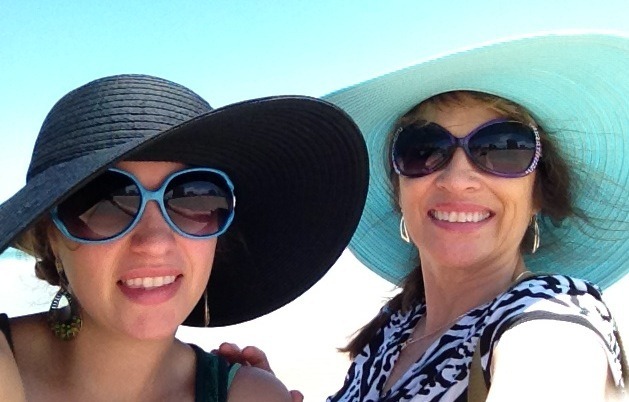 And not to mention is was in the upper 80’s! 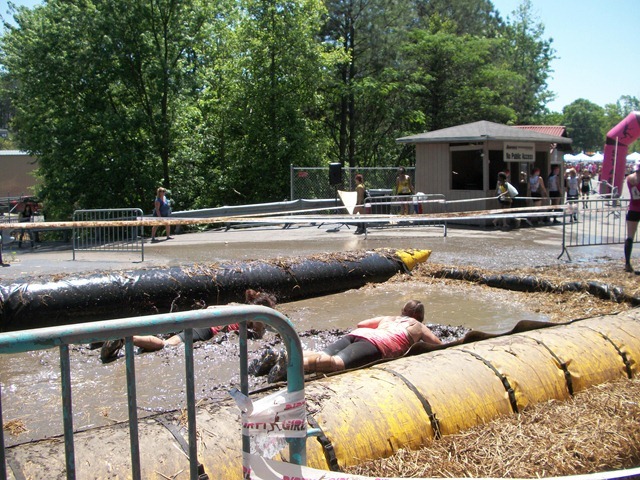 It was so hot that I was actually daydreaming about diving into the mudpit. 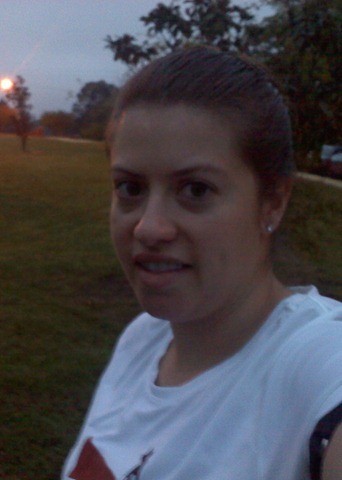 After I picked up my packet I was on the hunt for my running partner. 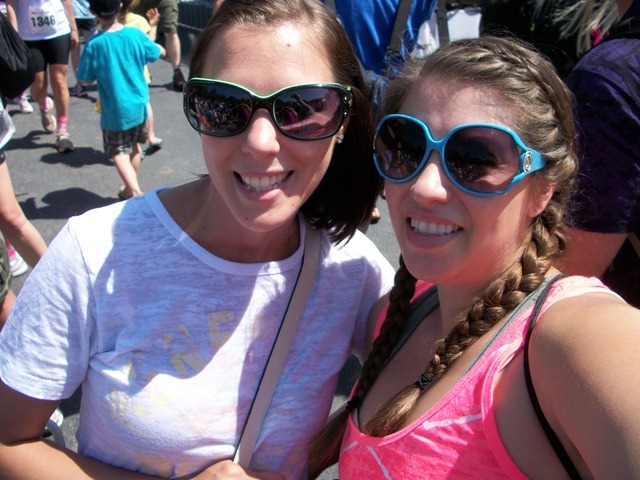 We found each other in the crowd and quickly got pumped up about the adventure we would soon be going on. 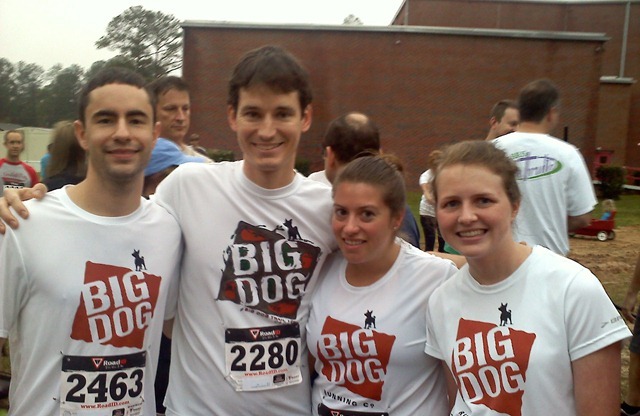 Oh yeah, and a few pre-race photos were taken. We had to get some clean ones in there before all the dirty ones to follow. LOL. 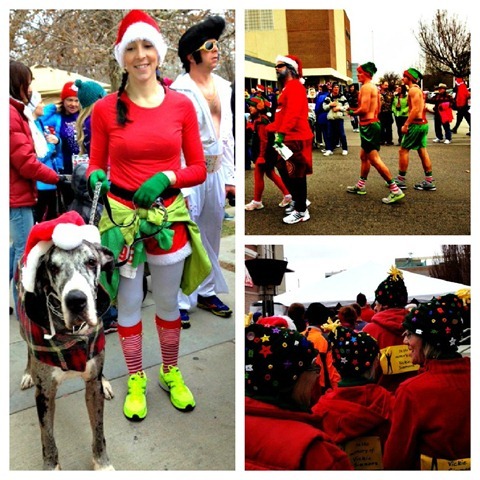 There was a super fun vibe going on at the start line. The music was blasting, and everyone was cheering and dancing. I was pumped! 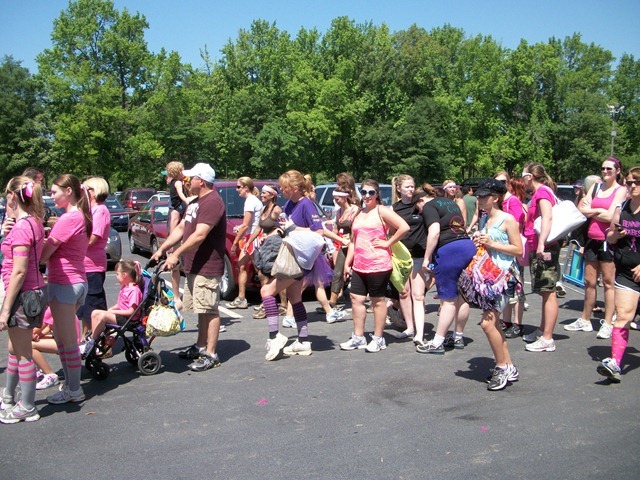 Soon enough we were lined up to start the race, and then we were off! We actually ran about a half mile through the park before we hit our first obstacle which ended up being a tower of hay bails that we had to climb over. 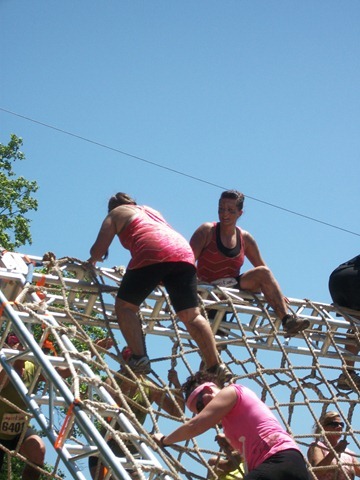 After that we continued running on in the heat to find our second obstacle involved an army style crawl through mud under a netting. Yay we were finally getting dirty! 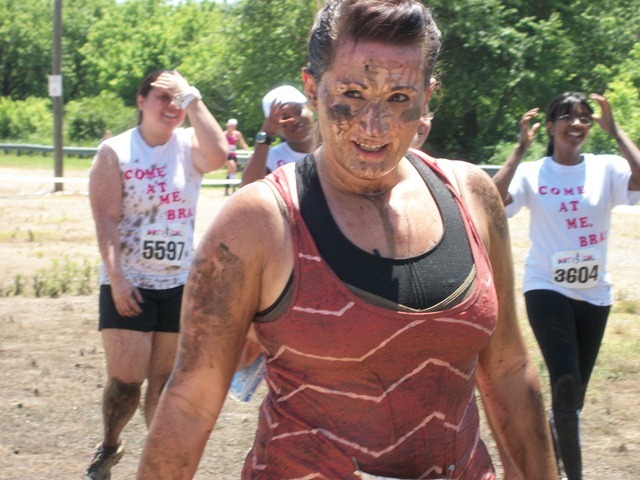 Our third obstacle was a love a much desired pit of mud. 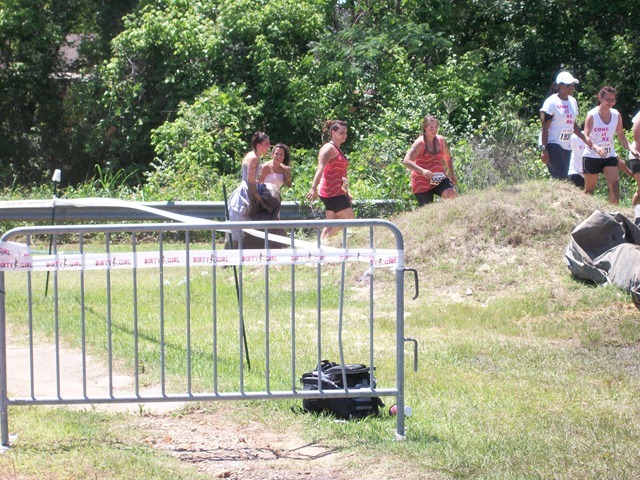 We watched as several of the women were prancing through it and coming out fairly clean. 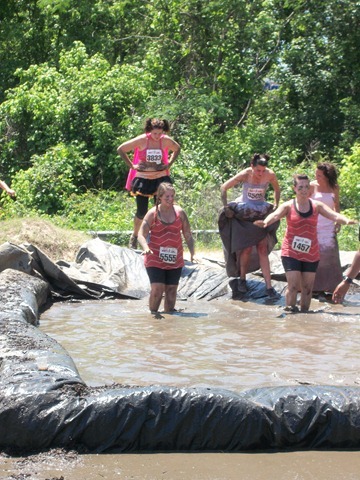 So we decided that we wanted to get as muddy as possible, and just dive right on in. Oh yeah! We had mud everywhere after this! Next up was the tire run. Well right back up she went! 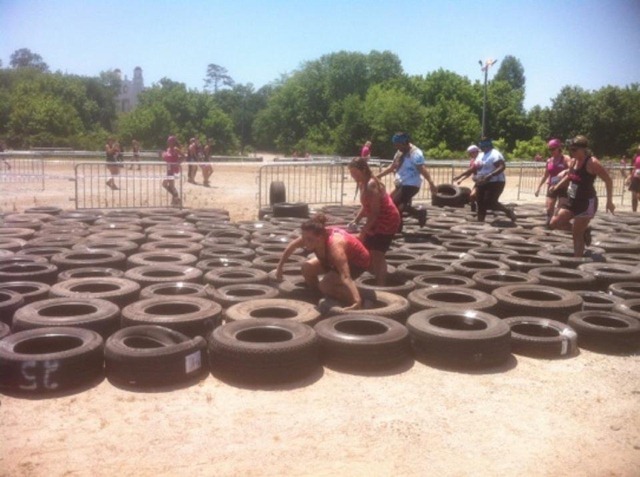 The tire run was actually harder than I imagined it would be and I’m surprised that I didn’t fall. 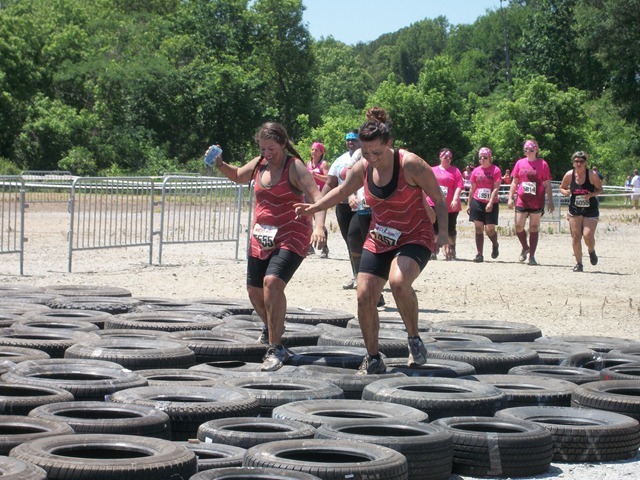 We ended up skipping one obstacle after the tire run. The line was backed up by like 40 people and I could feel my skin burning from the sun. 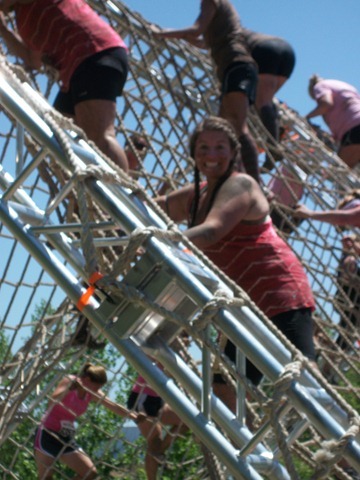 So we just zig-zagged through the park until we made our way to the next obstacle. 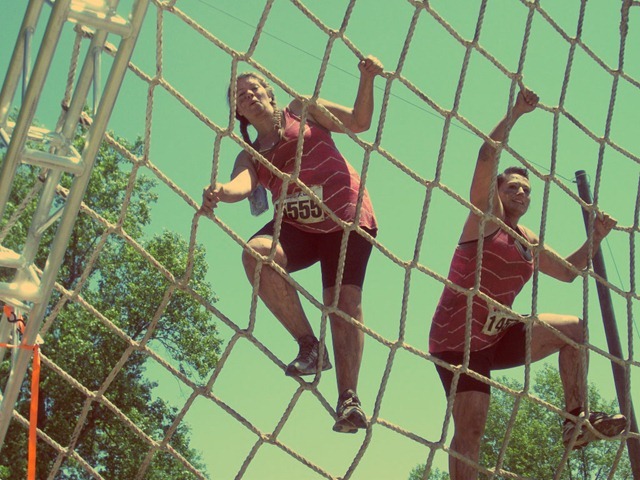 The net climb was one of the hardest obstacles in my opinion. It was like 30 feet high and a bit scary once you hit the top and had to climb down. But we both conquered it like champs! 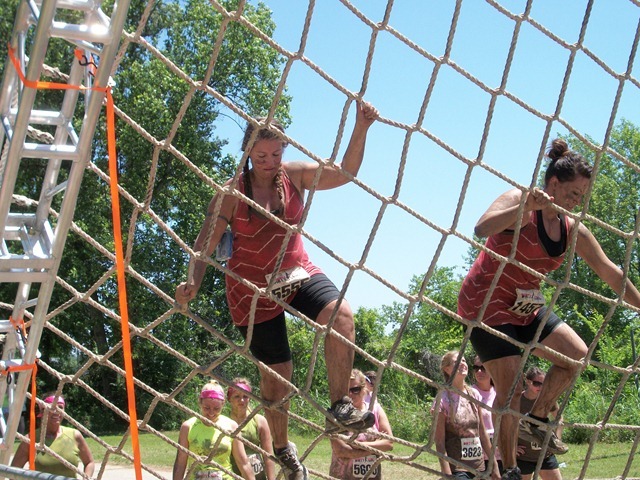 There were a few more obstacles after the net climb, but it wasn’t in range of our photographers. We had to scaled down the side of a hill and then scale back up it. 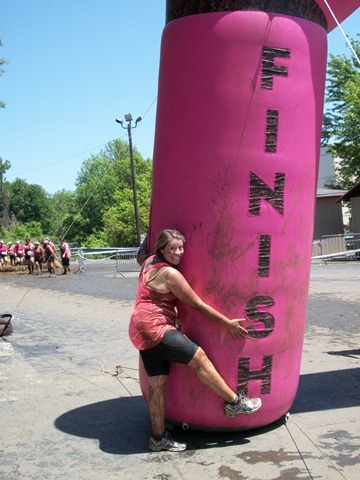 Then we had one final run to the final pit of mud. And head first again! It was too fun to just dive right in. 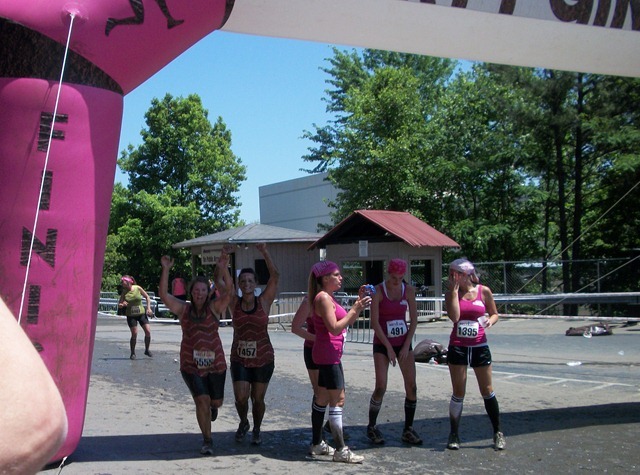 We sped to the finish line and were jumping with excitement when we had finished! 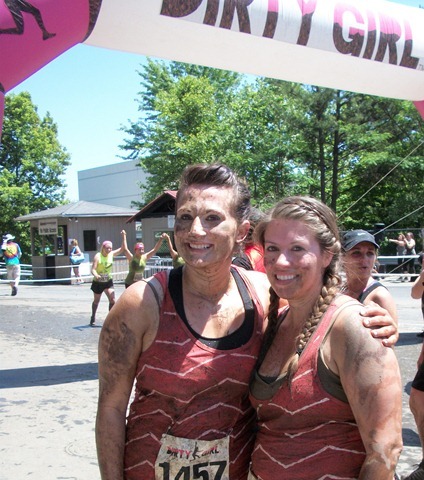 We were hot, sweaty, muddy and happy! 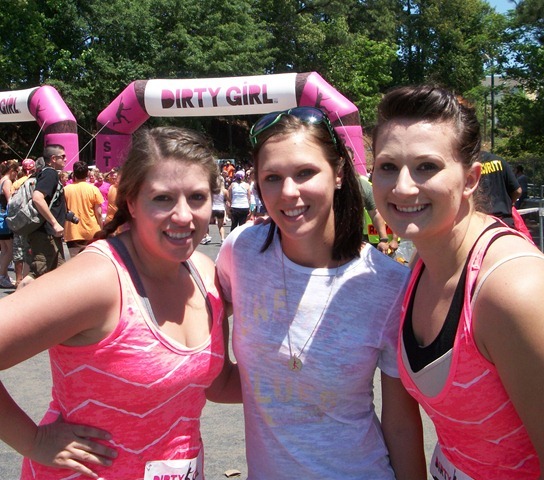 Go Dirty Girls! 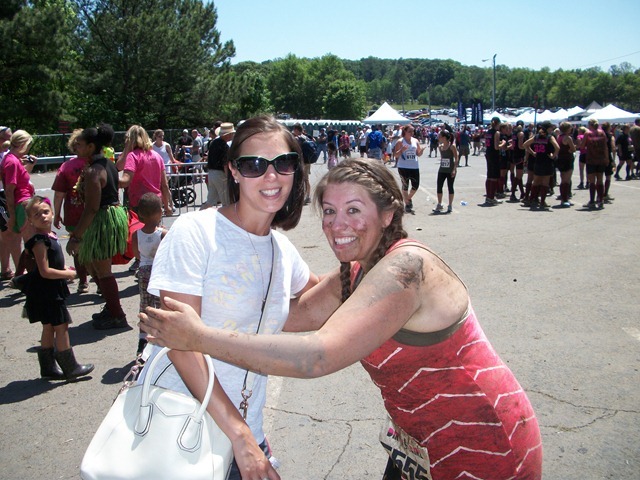 It was so tempting not just give her the world’s biggest muddiest hug…lol but I played nice and we faked this hug for the camera. We then headed to the shower area. Girls only! 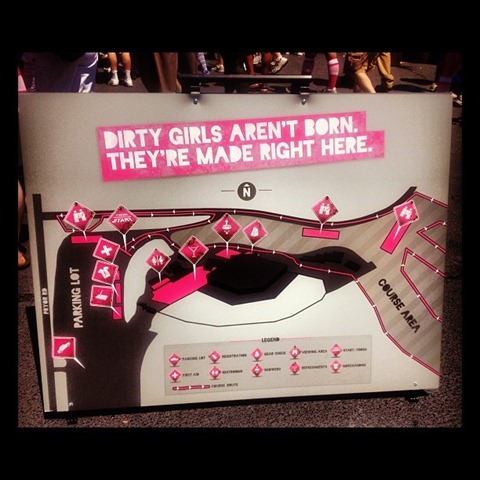 I appreciated how the race catered to women, as it was a women’s only race. 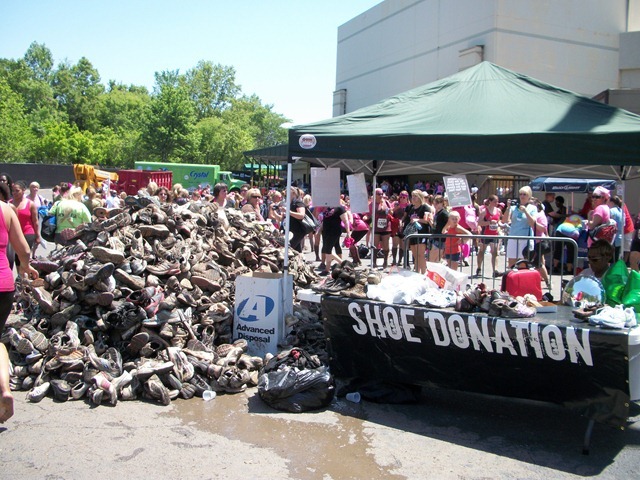 And I was completely in awe of the gigantic shoe donation pile. 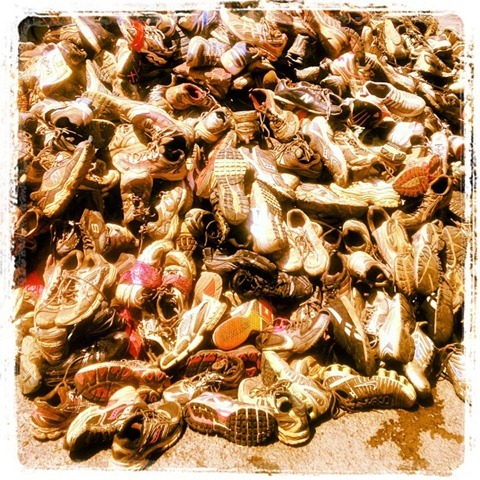 It was an awesome feeling to throw our shoes into the mix after the race and know they will be going to good home. 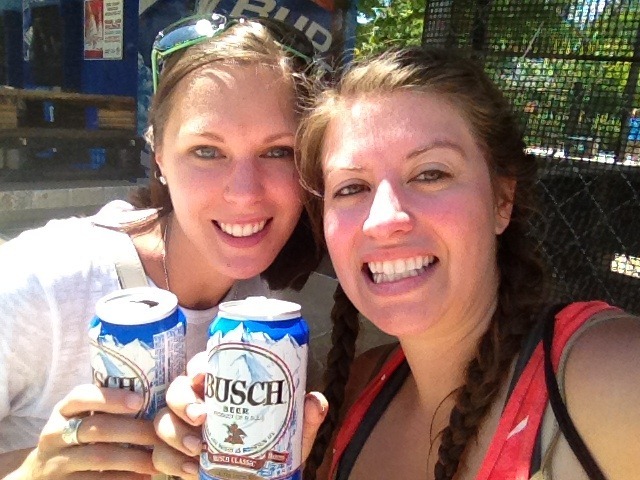 Then it was time to celebrate our accomplishments with a nice frosty Busch beer. Mmmm…nothing ever tasted so good! My experience of the race was a positive one. 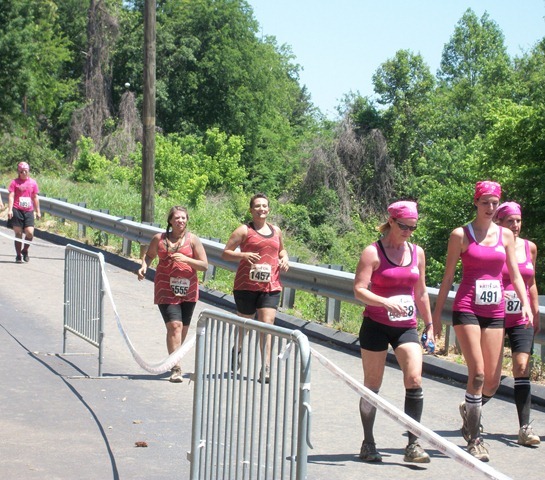 It was so fun to run with just women, and I think they made the obstacles challenging enough but with easier options for those who maybe weren’t feeling it. 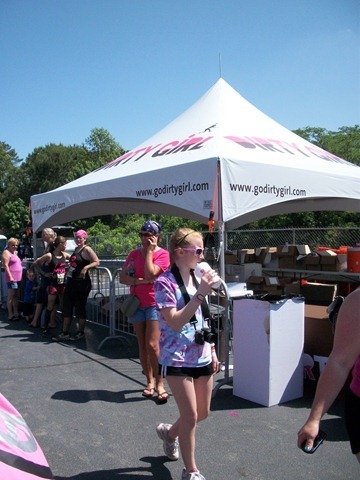 There was definitely an abundance of water stops [thank goodness] as I think we would have passed out due to the heat. 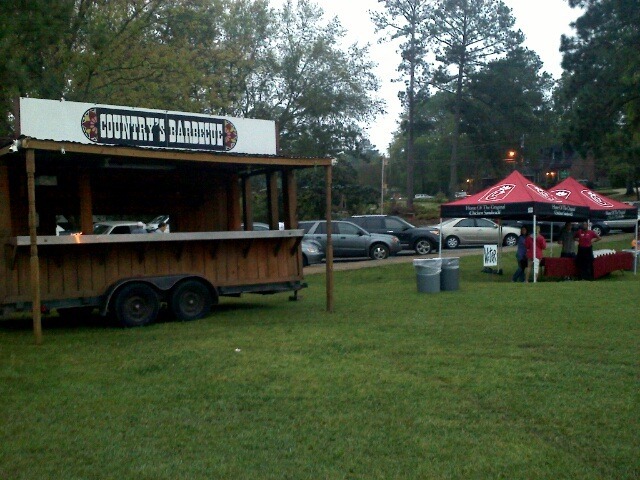 And the volunteers were amazing!! 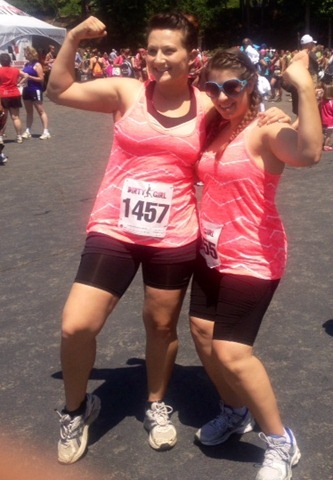 The running portion of the race was actually more than I expected. 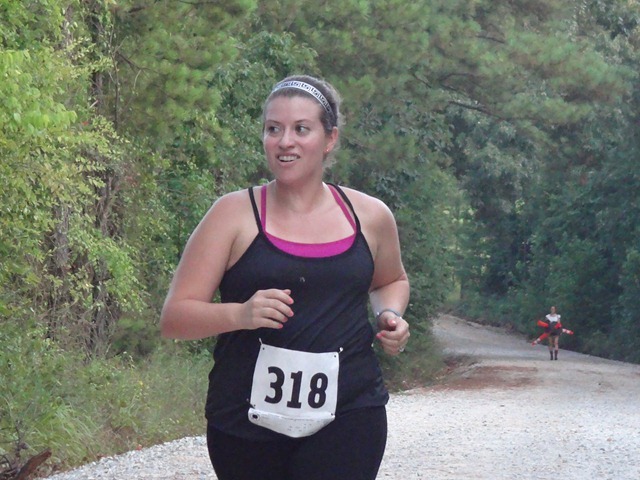 But I’m glad, I still wanted to count this race as a workout. And I think it was judging by how sore I was on Sunday morning! 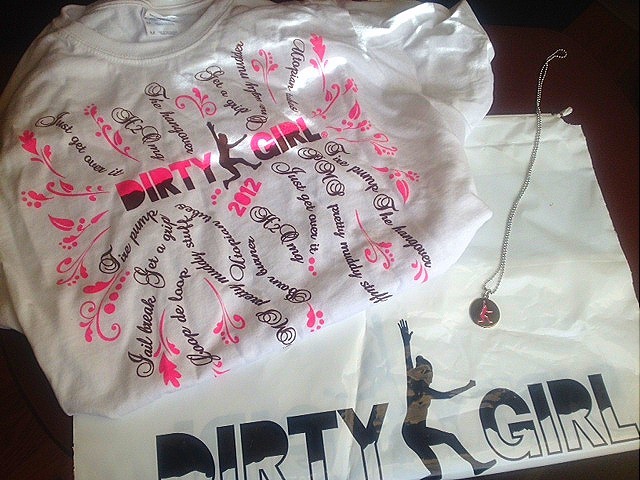 And the t-shirt and necklace we received were a fun girly touch. 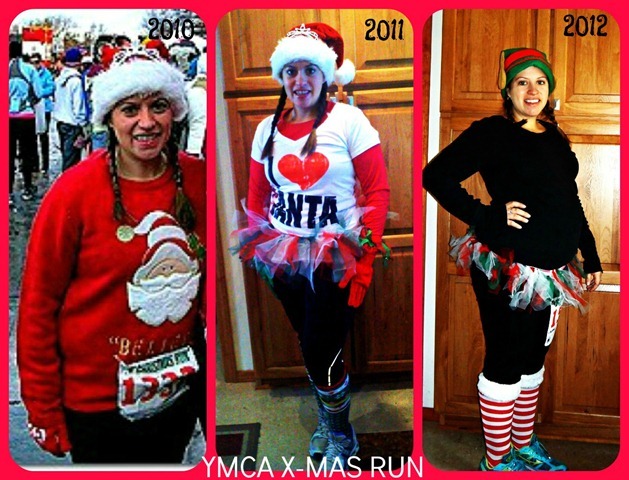 It was such a fun race and I was so glad to have been given the opportunity to do it. I wish I had connected with some of the other FitFluential people out there, but it was kind of a mad house at the race start I didn’t end up finding any of them. 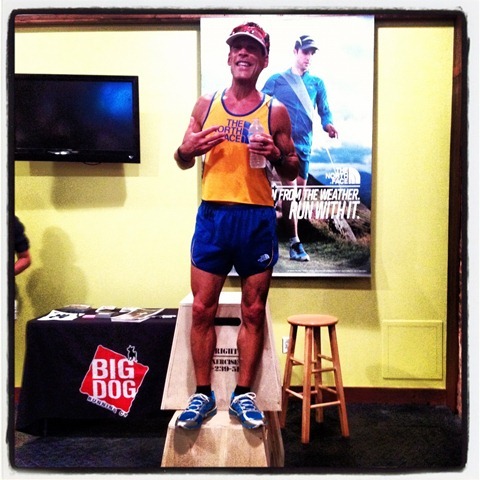 FitFluential LLC compensated me for this campaign. All thoughts and opinions are my own. I haven’t talked too much about my new job at the running store yet, which will be coming sometime soon…but one of the newest “perks” of my job is running in races for f-r-e-e.
Our company sponsors a lot of local races, and from time to time in return gets a few comped race entry’s. This past Saturday [not even two weeks a veteran at the new job] and I was already representing my peeps out on the race course. Woop woop! 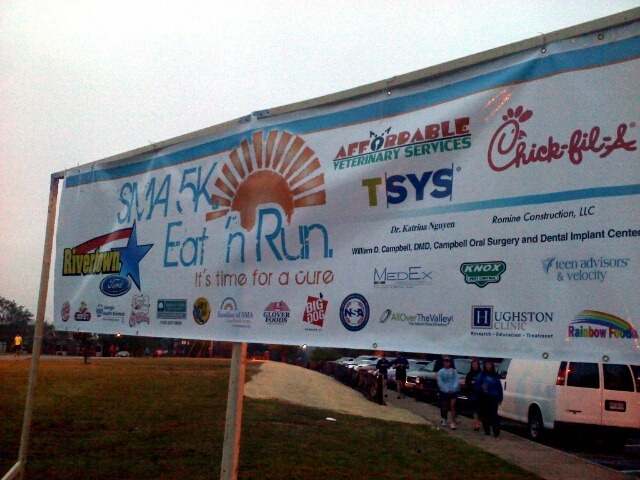 We ran in the SMA Eat ‘N Run 5k, a fundraiser for children with Spinal Muscular Atrophy. 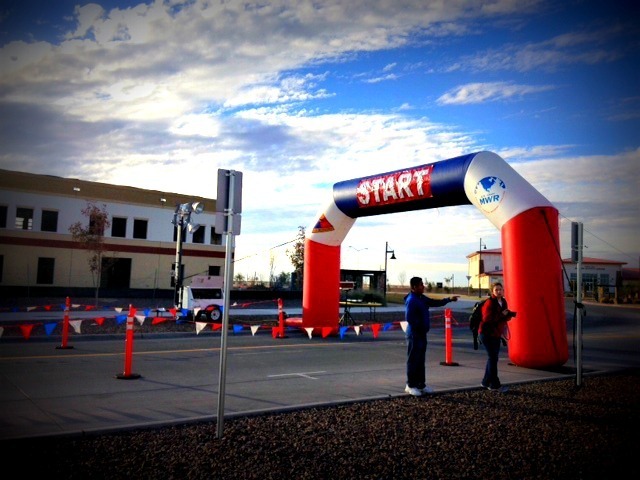 The race started a little after 8:00 am and I was pleasantly surprised with the weather. 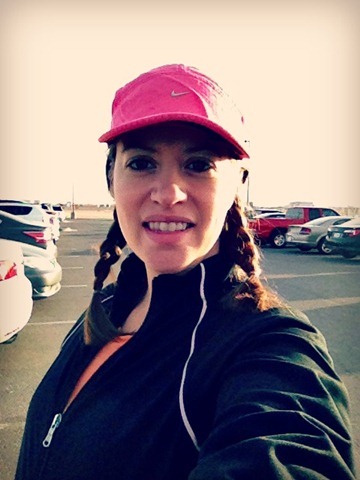 There was a slight breeze in the air, and overcast above –my favorite type of running weather. 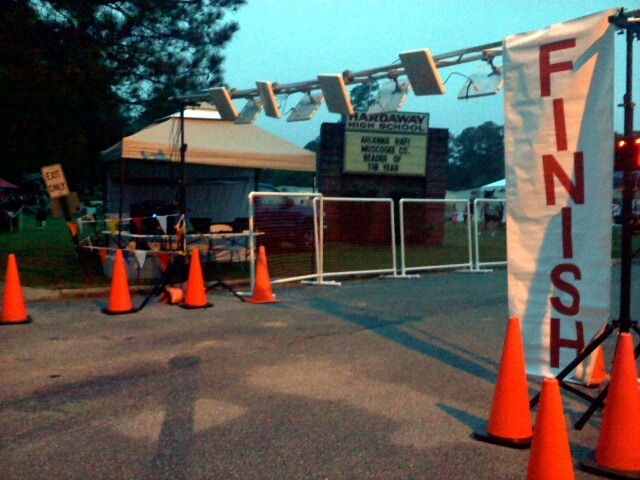 The humidity didn’t hit until about half way through the race. It always sneaks up on me! 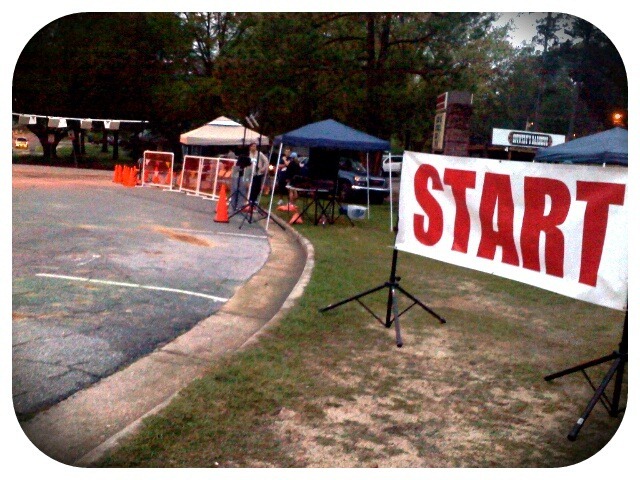 The first mile of the race started on an extreme downhill which got me excited for my speedy start. But I quickly realized what goes down in a race, usually comes back up. By the end of the first mile, I was huffing and puffing back up that hill and cursing myself for starting too quickly at the start. 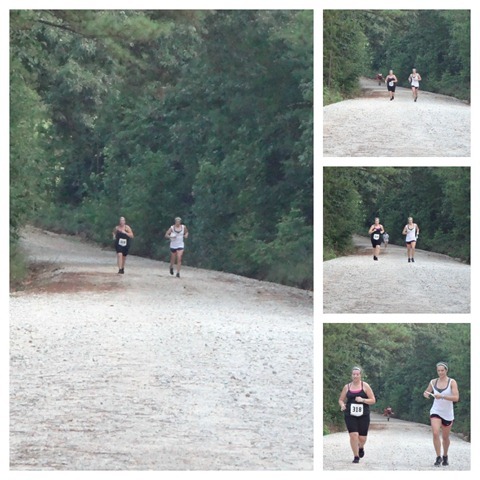 The course circled through Columbus State University Campus and through some cute neighborhoods around the local high school. 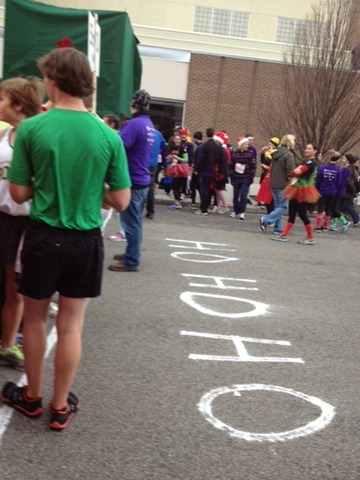 Around mile two I was having some serious pains in my Achilles. I haven’t quite mastered the whole being on my feet for 40 hrs a week and running yet. (As you remember I was unemployed for 5 months, and the three years before that I had a desk job). 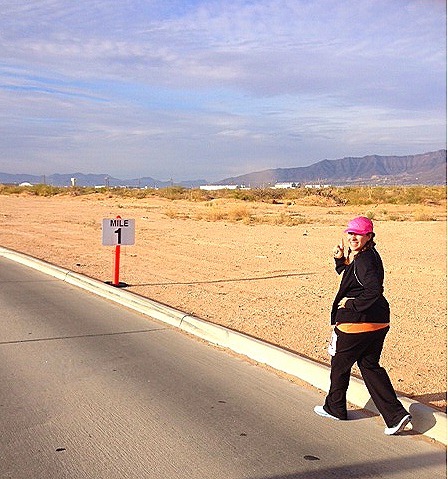 There were a few walk breaks, and then a final sprint toward the finish line. I finished in 33:03, which is one of my slower 5k times but I’m still okay with. 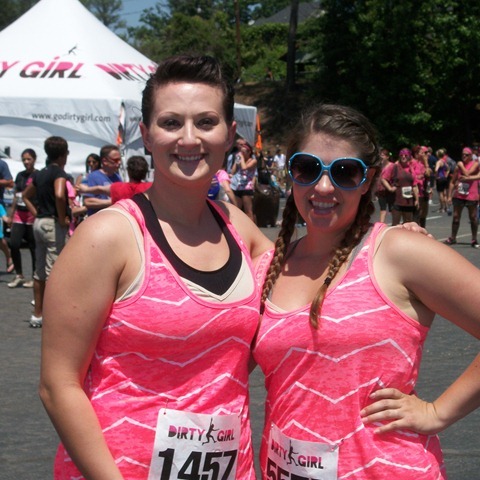 It was a cute local race for a great cause! The after party was totally my style. I mean it’s called Eat ‘N Run for a reason right? 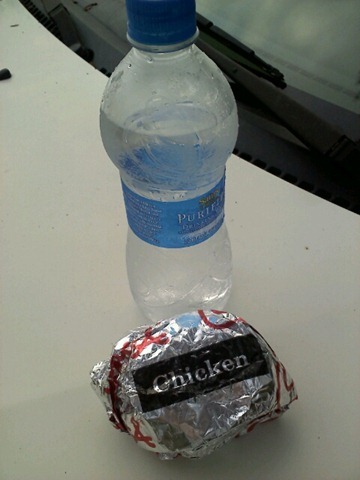 I was all over that Chick fil a breakfast sandwich as some post race fuel. 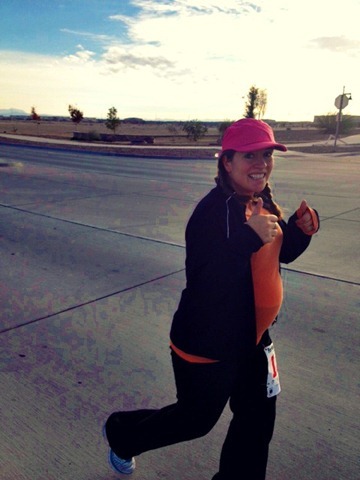 And then I did just as the race said – ate ‘n ran. It was off to the running store post race for a full day of work. 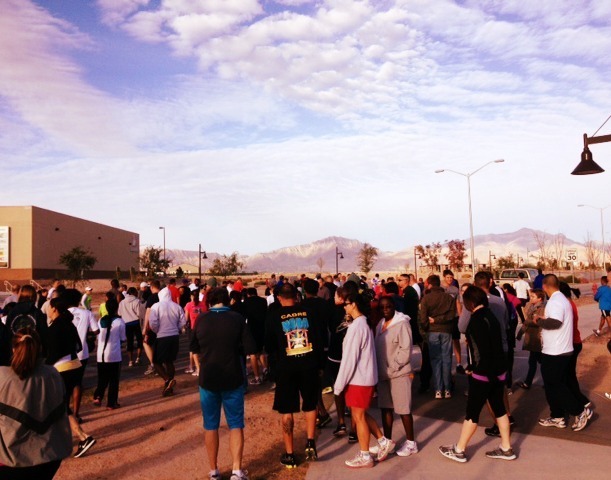 Though I must admit it was such a fun way to start my workday by racing for a great cause. 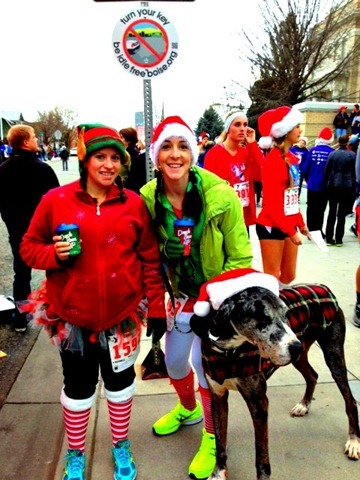 Shamrock Shaker Winners Announced: Jess from Run with Jess won our spirit prize, and the random number generator picked Natalie from The Funner Runner as our other Shamrock winner. Thanks again for everyone who participated! !